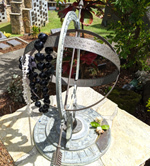 This is a complete listing of sundials in the North American Sundial Society Registry. Click on any dial thumbnail picture or city name to display the full dial listing and images. To see sundials from a particular state or province, you may click on the list at right to see all registered sundials in that state, province or country (at bottom) displayed in city order. You may also type into the NASS search field at upper right any search word such as "equatorial" to get a list of all articles mentioning equatorial dials and a list of all equatorial sundials in the registry. (Try other dial types: "vertical", "horizontal", etc). A 15 inch octagonal bronze horizontal dial with a bronze gnomon. Dial face shows hour, half-hour, quarter-hour and 5-inute marks with Roman hour numerals. The gnomon is damaged and analysis shows the dial hour lines are laid out for approximately 45° latitude instead of the local 37° latitude. The dial is on a white granite pillar. A 32 inch diameter bicolored Coconino sandstone horizontal dial with hour, half and quarter hour marks and Arabic hour numerals showing DST with longitude correction. The large noon gap is marked, High Noon. Dial face has carved time ribbon with inlayed brass balls on quarter hours. Gnomon sides show carved sunface and moonface. Dial is placed on a cast concrete pedestal approximately 20 inches high. A monumental sculpture of steel and stone including a 12 foot diameter horizontal dial with six foot high gnomon. Stone dial face includes hour markers and Roman hour numerals. Titled Spirit of Punta Gorda, the sculpture is dedicated to the spirit of the people of Punta Gorda in the aftermath of Hurricane Charlie on August 13, 2004. Two nearby bronze plaques identify and dedicate the sculpture. A nearly 10 foot high steel equatorial dial with a 30 inch diameter stainless steel hour ring including cut-out diamonds for hour and half-hour marks and Roman hour numerals. The hour ring can be adjusted for EST or EDST and can be set to include longitude correction. The mild steel sculpture has naturally weathered. Located outside the YSU Ward Beecher Planetarium, the dial is dedicated to the memory of Richard Pirko, long-time planetarium engineer and show producer, whose dream was to have a sundial outside the planetarium. A nearby bronze plaque dedicates the dial. A 6-1/2 foot tall, 4 foot diameter helical cylinder equatorial dial of self-weathering COR-TEN steel plate. The 2 foot long beveled edges of the two ends of the helix serve as gnomons, casting shadows for standard time and daylight saving time onto the interior surface. Time is indicated by the dominant shadow, top in summer and bottom in winter. Hour marks are shallow bored holes in the interior surface; no numerals are present but the noon mark is indicated by two small adjacent holes. The helical curved edges allow shadows to fall on the interior surface throughout the year as solar declination varies. An adjacent bronze plaque describes the dial and gives an EOT and longitude correction graph. Dial is supported by a curved COR-TEN steel plate allowing some springy motion. A weathered 10 by 15 inch oval marble horizontal dial with bronze gnomon. Dial face has hour lines with Roman numerals showing standard time. Dial sits atop a concrete pedestal with two steps at base. Pedestal has insets on faces, one of which carries a marble plaque with barely readable inscription. A carved stone, south-facing vertical dial with polar-pointing gnomon, hour lines and Roman hour numerals. The construction date of 1817 is prominently shown at the top of the dial. This is a historic Cuban sundial, known at the "dean of Cuban sundials" and referenced in "This is Cuba, Things of My Country." An approximately 18 inch diameter equatorial dial of brushed aluminum and stainless steel with painted steel equatorial and meridian supports. Hour lines and Arabic hour numerals are marked on dial face and a bow string gnomon is tensioned by the meridian arc, which is adjustable for latitude and provided with a marked scale. Meridian arc is supported on a 3-inch diameter steel pole fixed in concrete. A 12 inch diameter (perhaps bronze) horizontal dial with hour lines and half-hour marks and Roman hour numerals. Inscription area is heavily corroded. Dial rests on a mortared marble stone pedestal. This may be a commercial stock dial and the design may be flawed as the gnomon root appears to be north of the 6 AM - 6 PM line. A cast concrete horizontal dial with a rugged steel water pipe gnomon. Dial face has hour and half hour marks with Roman hour numerals showing CDST and a compass rose with dial coordinates. A graph marked in the concrete shows EOT correction. A massive, 24 foot tall combination almost-vertical and calendrical dial facing southwest so that northeast bound traffic can easily view the dial. The 13 foot diameter vertical ring dial of welded, zinc-coated steel declines 45? west and reclines 12? from vertical. The 3 inch diameter, 20 foot long polar-pointing gnomon tube is supported in space by a 10 inch diameter support tube with a cone nodus on the bottom end. The vertical dial shows longitude-corrected MST with hour and half-hour marks and Arabic numerals on the outer stainless steel chapter ring. The calendrical dial solar noon line is a bronze plaque atop a triangular, fin-shaped concrete pedestal and inclined at the latitude angle, allowing the equinox mark to be in the center of the date line with the indicating shadow cast by the cone nodus on the bottom of the gnomon support tube. Other significant dates indicated include the solstices, date of dial dedication, date of Oro Valley incorporation and the date of Arizona statehood. As of July, 2012 the date line of the calendrical dial remains fully designed but incomplete and uninstalled so this portion of the dial is not functional. Dialist John Carmichael reports this is the most difficult and complex project he has designed. The dial base is a modern sculpture of welded steel plates by artist Jon Seeman. This 10,600 pound monumental dial was three years in design and fabrication. The Bowie Portal Dial is a 48x66 inch vertical dial of frosted glass atop two 15 foot tall steel beams. The dial face has bronze filigreed hour lines, Roman hour numerals and a supported bronze gnomon. The translucent glass allows the dial time to be read from both sides. At ground level the two steel beams are surrounded by steel benches covered in granite and form a portal with the silhouette of playing children cut of brass sheet riveted to the stainless steel base. The 11 foot wide base depicts running horses cut in brass and sits atop a 16 foot diameter compass rose. The base includes a plaque with the EOT. An 84x47 inch vertical dial declining 18? east of south on the outside wall of a private residence. Roman hour numerals are on 8 inch square hand-painted ceramic tiles. The gnomon and support are welded wrought iron painted black. A hand painted EOT graph is shown on a matching ceramic tile. This is a historic home designed by southwestern architect Josias Joesler. Homeowner found original architectural drawings showing a gnomonically-flawed sundial that was never installed and contacted John Carmichael to design this accurate new dial. A combination horizontal dial with nodus on its gnomon and a meridian projection dial located below. Horizontal dial face is 44 inches diameter and made of polished Chinese gabbro basaltic rock, reflecting clouds overhead and gnomon shadow, which shows location of solar noon on gnomonic projection map of the world on dial face. Gnomon is supported by curved triangular bronze arches. Gnomon nodus shadow shows location on map where sun is directly overhead while solstice and equinox lines indicate date. Hour markers show EDST by Roman numerals with ten minute increments by Arabic numerals and marks for one minute. Dial is supported on an octagonal limestone pedestal with French Gothic cathedral window design allowing viewing of meridian dial date line. Meridian dial is placed below the octagonal limestone pedestal whose French Gothic cathedral window design allows the noon date line to be seen. The date line is illuminated only at noon by sunlight passing through a slit orifice that extends 2/3 the way up the pedestal wall, indicating dates between summer and winter solstice by the end of the end of the bar of light. The entire combination dial sits on a plaza inlaid with three types of granite to form a 32 foot diameter compass rose, with sunrise and sunset times shown for sixteen dates special to Notre Dame University. A 23.5 foot major axis analemmatic dial with a 10 foot tall movable steel vertical gnomon. Hours are marked by numerals on solar-powered lamps on the ellipse at the perimeter bush line. The concrete dial face consists of an 8 foot dais that displays the EOT and hosts a handsome gargoyle. This private dial is available for viewing by contacting the owner. A 14 inch square California granite horizontal dial with a bronze gnomon with hour and half-hour marks and Roman numerals showing PST. Dial face is engraved with the Class Year 1916 and the motto Audacity, Sagacity, Holiness and Charity. The gnomon may have been replaced since originally installed. The dial is atop a gray granite pedestal integral to the dial itself. The June 8, 1916 Collegian university newspaper provided this: "In presenting the sundial to the university, Walter Gleiser, president of the class, gave a forceful speech in which he portrayed the never-failing accuracy of the instrument's function, believing that it would be of use to the community, and that it should symbolize the good that students of Willamette should be to the world." An approximately four foot diameter equatorial ring dial of natural stone and steel with an analemmic gnomon. Equatorial ring has hour and 15 minute marks with Arabic numeral for PST and PDT. A plaque indicates how to read the shadow of the gnomon, shows primary directions and identifies the dial designer. Plaque includes an analemma showing the equinoxes and solstices and states the dial is accurate within 2 minutes year around. Since the dial includes an analemmic gnomon, no application of EOT correction is needed. A six foot diameter armillary sphere of steel and bronze with equatorial, meridian, equinoctial colure, ecliptic, Arctic and Antarctic rings. Equatorial ring has Roman hour numerals but no hour marks and includes gold plated Zodiacal symbols on exterior of ring. The sphere base is supported on the backs of cast tortoises atop a 3 foot high square marble pedestal. This dial is located under a heavy canopy of trees and likely never gets direct sunlight today. A 10 inch round bronze horizontal dial on an octagonal stone atop a 3 foot high brick pedestal. The pedestal is in the center of a 10 foot square stone area raised about 6 inches. Dial face has Roman numerals, hour lines, five minute marks and a central compass rose. This dial is located under a heavy canopy of trees and likely never gets direct sunlight today. Surrounding plaques read, "In the center of this square the early colonists placed a sundial" and "Erected by the society of colonial wars in the state of Georgia Feb 1933 in commemoration of the 200th anniversary of the founding of Georgia.